2019 Sacramento River Salmon Fishing Map and Fishing Report, how to fish this River! For the map above, the red bubbles are the best Salmon holes, and the arrows pointing to riffles are the best steelhead areas!!!!! Salmon Fishing Report season opens on mid July 16th 2018 until mid Dec.
With the July 16 salmon opener on the Sacramento River just a few days away, anglers are optimistic about this year’s king run as ocean fishing remains wide open outside the Golden Gate. When the Sacramento opens below Red Bluff on July 16, Weese said he will be running T50 and T55 Flatfish with sardine wraps in the mornings and then switch over to salmon eggs later in the day. Trolling with flatfish lures is better that anchoring this time of year because the fish are more scattered. Fall 2018 - Late year fishing on the Sacramento River between Anderson and Chico is decent for the fresh looking silver King Salmon reports local sources. Flatfish plugs with sardine wraps seem to be working but alternate to roe if things get slow. The Bend to the Barge Hole is the best choice right now. 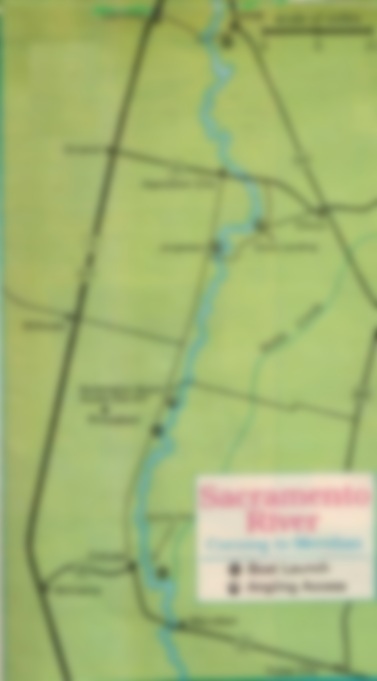 Read the rest of our blog about how to fish the Sacramento River for Salmon and reference our fishing map for more information. Sacramento River offers world-class in the Red Bluff area some of the ﬁnest river salmon angling in the West. Chinook salmon in the Sacramento River starts July and peaks in August in the beautiful, bountiful stream, while the fall run peaks October, logic would dictate even September is a excellent mid way time for the great Chinook ﬁshery on the Sacramento. The winter run peaks in December. 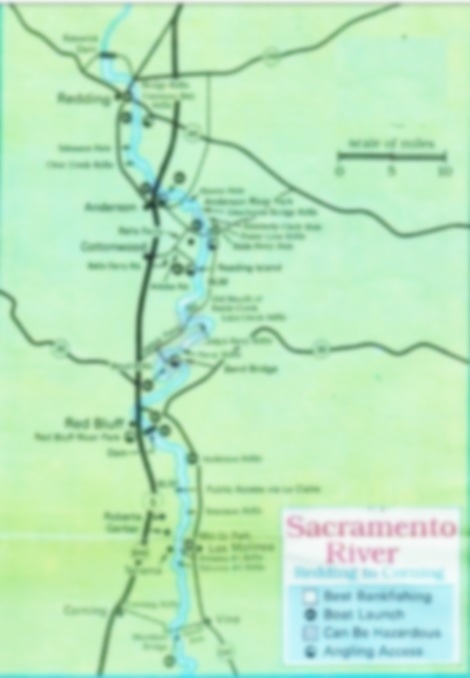 Generally salmon fishing from the Delta up to Sacramento, fishing is okay on American River, Knights Landing, Grimes, Colusa and even all the way up to Chico.. But ﬁshing is spotty as the fish are in a hurry to get to the spawning grounds upstream. CHINOOK SALMON are fished using roe and back trolling Kwikﬁsh or flatfish wrapped in sardines. The Sacramento River produces, an average salmon 16-22 pounds, but 30 pounders are common and sometimes 40!. The best salmon ﬁshing in the Sacramento River can be found upriver from Los Molinos to Anderson. Fishing is fair at best above Anderson, mainly because of a lack of good Chinook holes and the fact that Kes wick Dam is the end of the line. Access starts at Los Molinos, off Tehama-Vina road, east of Highway 99 East. 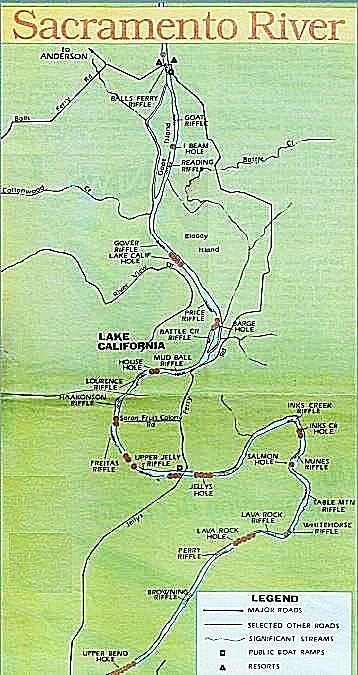 Upstream, try the Salmon Hole, Car Body Hole and Salt Creek Hole. Action is good from Dairyville north to Bend, especially in the Pigeon Hole and Soapies Hole. Salmon pile up below the Red Bluff Diversion Dam, at least during high ﬂows. when it‘s often difficult for them to get to the ﬁsh ladder and continue their migration upstream. After launching at one of the resorts, head downstream about 2 1/2 miles down- stream to the Lower California Hole, it's worth a shot, as most head to the Barge Hole where it’s heavily ﬁshed but just downstream from the Barge Hole is the Old Mouth of Battle Creek this hole is a close second to the Barge Hole. Launch at Ball’s Ferry Resort, on downstream to the Barge Hole. 6-foot rods equipped with wind reels, 25pound test line with 8-ounce weights, No. 2 treble hooks, salmon roe. Keep the boat bow pointed upstream and back troll against current, just fast to keep the boat in place to back bounce our along the bottom. You must be able to get your weight hitting the rocks down deep. Anglers can also launch at Rooster’s Landing, depending on which side of river you come from. 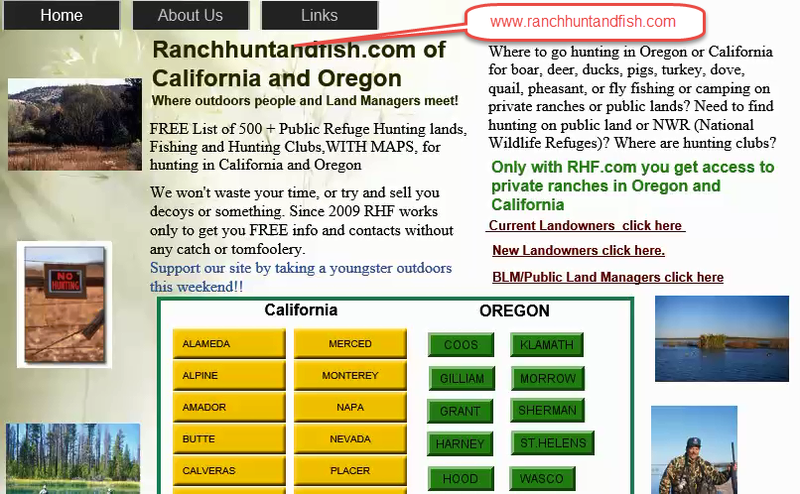 Free Fishing and Hunting Maps and access to hunting clubs and private ranches!